I still get surprised by small world stories. I moved to Seattle in August 2016. A friend of mine lives in Belltown; when we catch up for a drink, we usually head to Rob Roy. It’s a cool setting. They make great cocktails, you can usually find a couple of seats at the bar, and the acoustics actually allow for conversation. I can’t remember if it was August or September. My friend and I were sitting at the bar, and we started talking to our bartender, Jacyara de Oliveira. There was a lot to talk about. Turns out she had also recently moved to Seattle, from Chicago, but she did not take the point A to point B direct flight. Instead, she and her partner lined up jobs in Seattle, put some of their stuff in storage, and then biked from the east coast to the Pacific Northwest. I’m not a bar or restaurant expert, but I remember thinking at the time that it cannot be easy to make that kind of city to city jump in an industry that relies so heavily on local reputation and professional contacts. I think my instincts were correct, but more on that in a moment. I’m not a bar snob. A neighborhood watering hole in a bland strip mall can be the perfect spot for a cold beer with friends. But if I’m in the mood for a good drink, one prepared with that little extra attention to detail, I prefer bars that give you the feeling that Hemingway or Maugham might walk in at any moment. Rob Roy’s old school wooden bar, leather seats, and bookcase stocked with vinyl albums and hi-fi stereo components lend themselves to that literary fantasy, but in the end it comes down to the bartenders and the service. Ms. de Oliveira, with her quiet cool and professionalism, subtly reinforces the notion that you are in a good bar, intent on having a good drink. In January I was at Capitol Hill’s Witness having a drink and talking to Kevin, a long-time bartender steeped in local industry knowledge. I wanted to get his thoughts on a photography project I’ve been kicking around that would focus on old Seattle bars. Ideally it would also include profiles of veteran bartenders. That eventually led to him mentioning the Speed Rack competition on 8 January 2017. I’d never heard of it, so he explained that it was a competition designed to recognize a city’s best female bartenders. The winners would then compete nationally. This is where the small world story starts to kick in. I returned to Witness a couple of weeks later and met a bartender who works at Rob Roy. I told him they have a great bar and an excellent bartender from Chicago. I’d forgotten her name, but when I described her recent bike trip across country, he realized I was talking about Ms. de Oliveira. He noted that she’d just won Seattle’s Speed Rack competition. Sometimes you have to run with coincidences, so I contacted Ms. de Oliveira about sitting down for a short interview and some photos. She agreed, so we met at Analog Coffee, her favorite Capitol Hill coffee spot. Our first meeting was in early February in what I’m told has been an unusually cold and wet winter. I moved here from DC, and I’ve found it surprisingly cold. Ms. de Oliveira was sitting in one of the bar chairs, working away at a laptop. I hadn’t been to Rob Roy for a while, so we caught up a bit, and then I explained what I had in mind - a short profile with Seattle’s reigning Speed Rack champion and some casual shots of her going about things in Seattle. She was game, and I launched right into some questions. The Speed Rack competition, which rewards speed, precision, and proficiency, was an obvious starting point. She won the 2017 Seattle competition, which was no small feat. But the winner’s circle wasn’t unfamiliar territory; she also won in Chicago in 2015. 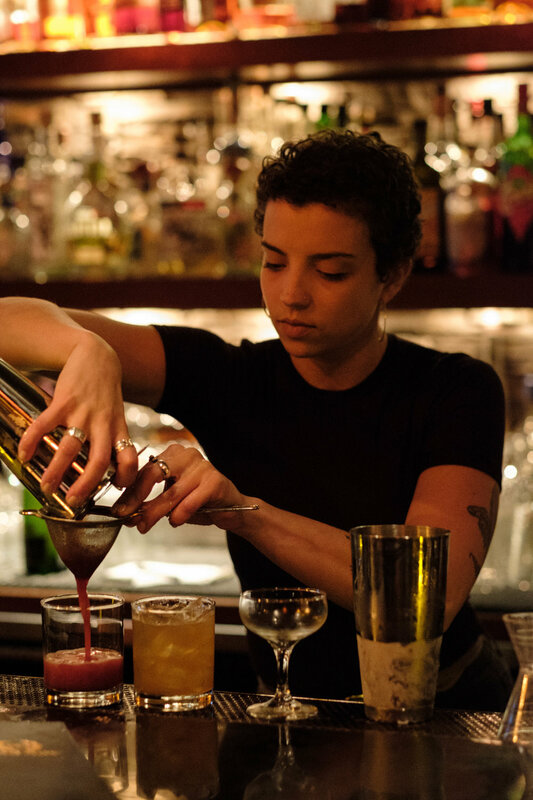 While Ms. de Oliveira is clearly formidable behind the bar and competitive, she’s quick to point out that Speed Rack is not a zero sum game. The competition recognizes talented female professionals, raises money for the fight against breast cancer, provides valuable networking opportunities, and offers chances for newer bartenders to meet mentors. The reference to mentors intrigued me. Again, I’m not an expert on the bar and restaurant industry. I assumed that bartenders were largely on their own in terms of managing their career, and that upward mobility consisted primarily of gaining experience, moving to bigger bars, and possibly moving into management or ownership. Ms. de Oliveira countered by pointing to some of her mentors. For example, famous Chicago bartender Charles Joly always emphasized the importance of professionalism in the industry, stressing that bartenders are really never off duty. Even when you’re at another venue enjoying a drink (Ms. de Oliveira likes Babirusa, Foreign National, and Rumba in Seattle), you’re representing your bar. She also noted that, like in any industry, there is value in training and showing newcomers that there are opportunities for career diversification and creativity. To that end, Ms. de Oliveira discussed her plans to collaborate with others who need assistance in shaping and refining their vision to help ensure successful bar and restaurant launches. If we stopped there, you’d have the portrait of a solid bartender. But I think it’s in talking with her and watching her interact with patrons that you really see someone who is adept at tending the bar. If you catch Ms. de Oliveira at Rob Roy, rest assured that you’re going to get a great drink. Order a second round or make a return visit, and you might find yourself talking about great cocktails, cycling across the country, Brazilian martial arts (of the Angolan lineage), or why one shouldn’t underestimate halfling bards. The dying art of actual conversation - your smartphone will thank you for the mini-vacation.